Join us this week live at 11:30 am PST - Thurs. 12/21/17 when our guest will be, Henry Schuck, co-founder and CEO of DiscoverOrg, the leading sales and marketing intelligence platform. Under Henry's leadership, DiscoverOrg continues its exponential growth path, and in late August acquired its rival RainKing. The recording will be added here no later than 12/26/17. You can catch the recording and transcription on the Heinz Marketing blog on 1/2/18. 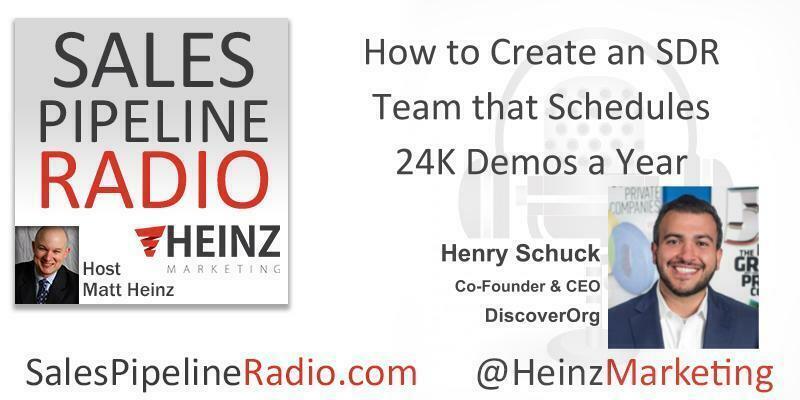 Henry Schuck is a leading entrepreneur in sales intelligence and lead generation. Having founded DiscoverOrg in 2007 when he was 23, he has led the company on a rapid growth path including funding investments from the likes of TA Associates, Goldman Sachs BDC, FiveW Capital and NXT Capital. Under Henry’s leadership, DiscoverOrg built the industry’s most accurate, highest-quality contact database, through a mix of technology and a team of live researchers who continually call into thousands of IT, marketing, HR, and finance departments. DiscoverOrg was recognized for the quality of its datasets with both a Stevie® and a CODIE award. It was also named a Leader and ranked Number One in customer service by G2 Crowd. Before founding DiscoverOrg, Henry managed marketing and research at iProfile leading the company to a successful private equity sale.